Joining the original color of NAS, the 6TB WD Red Pro SATA 6Gb/s 3.5" Internal Hard Drive continues the formula of success that has led the WD Red product family by adding support beyond consumer, SOHO, and small business markets into medium and large 8-16 bay business storage systems. 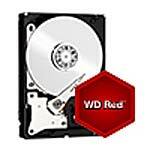 WD Red Pro hard drives integrate WD’s exclusive technology, NASware 3.0, to provide unparalleled support for drive compatibility, reliability, and performance. It enables seamless integration, robust data protection and optimal performance for systems operating in the demanding NAS environment. WD Red Pro is equipped with a multiaxis shock sensor that automatically detects subtle shock events and dynamic fly height technology which adjusts each read-write function to compensate and protect the data. This combination of technology further protects the drives in large 8 to 16 bay NAS environments and increases drive reliability. In combination with 3D Active Balance Plus, WD Red Pro also features hardware vibration compensation technology which monitors the drive to correct both linear and rotational vibration in real time, further increasing drive reliability. For overall enhanced accuracy for NAS, WD Red Pro is also equipped with dual actuator technology which improves positional accuracy over the data tracks and head positioning. StableTrac technology then secures the motor shaft at both ends to reduce system-induced vibration and stabilize the drive platters for accurate tracking during read and write operations. Both technologies are important for larger 8 to 16 bay NAS environments. Plus, it comes equipped with error recovery controls as part of NASware 3.0, which prevents the drive from fallout in RAID applications.